A tire pressure gauge can be a simple device but what is shows it very important for a car’s tires. 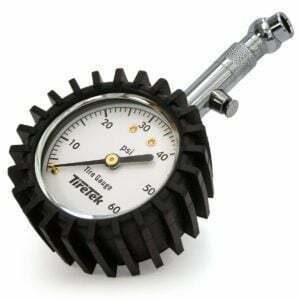 A tire pressure gauge can be a small gap between a completely deflated tire and a repaired one. The fact is that it’s very important to have in your tires the right amount of air pressure. A leaking tire may not be noticed until completed deflated and if left deflated for too long can damage the tires and the rims. Also, over-inflated tires can be dangerous in the summertime because the heat increases the pressure, and the tire can explode. Does that mean you will have to go to a tire shop every time you are doubtful of your tire’s pressure? No! Now with the portable tire pressure gauges available in the market, you can have your own personal pressure gauge you can use to check the air pressure in your tires. 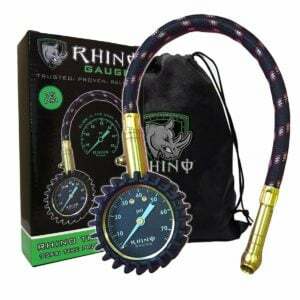 So let’s take a look at the list containing the best tire pressure gauges the market has for you. If you want to learn more about tire pressure gauges before doing your purchase, check our FAQ and Buyer’s Guide at the bottom of the article. Scroll down or click here. This is the top gauge on our list, and it’s also a manual dial gauge. Why we choose this gauge is the high quality, good price, and the highly accurate measurement because of the manual dial gauge and no need of batteries. Perfect in all situations. This device will give you the flexibility of being able to read between 0 to 75 psi with a digital reading. With its glowing in the dark feature, finding the unit in the dark won’t be a problem anymore and similarly, checking the psi will also be no problem as the LCD is well lit. The unit is accurate like many other units in the market and provides a sturdy design. Included in the package is a bendable hose to improve device usability. Its ergonomic design will ensure it doesn’t slip off from your hand. Since Rhino is a well-known brand, it guarantees complete comfort and usability and also offer the money back if you aren’t satisfied. What else could you possibly ask for from such a brand? Accuracy is not their feature but rather an aspect so expect most accurate psi readings when using this unit. It features a 360-degree swivel to improve usability even more so that you don’t have to manually tilt the unit. This is the 2nd gauge listed in this list, and actually the best Digital gauge in our list. Read under why we chose this to our 2nd place in this article. 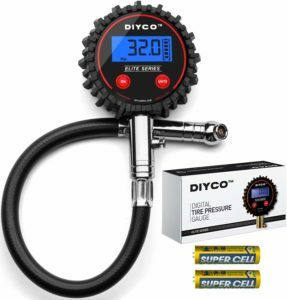 A professional digital pressure gauge, the Diyco Elite Series may look a usual tire gauge unit but its actually not. It has a backlit display with good visibility in day and night and its package includes a long hose for convenience in usage. It’s easy to use but can be a little expensive than its counterparts. The hose included with the package can be quite useless as its bendable and allow the user to keep the unit a little further away from the tire during its operating. Tekton gets on the third place on our list because of a lot of reasons. One of those reasons is the price tag of it. Tekton is made to comply with any and every tire nozzle and received positive reviews by the users and car fans. This machine provides some amazing functions and quality that many want for the price stated. To begin with, this gauge has a digital display to show you the tire pressure of your car. Besides that, you don’t need to worry about losing your nozzle cap on the tires with it’s built in right. Other than that, if you are working in your garage, and there is not sufficient light inside, worry not as the digital display will light bright enough for you to be able to properly see the tire pressure. In terms of the design, this gauge is made ergonomically so that you retain a good grip over it and not let it drop if you are holding it in the hands during its use. With its strong nozzle seal, the air that leaks during the clipping of the gauge’s nozzle onto the tire’s nozzle is decreased. And with the provided button, you can wake your gauge in case it goes into sleep mode. The batteries included can last for more than a year and more if maintained properly. This is the TireTek Premium. 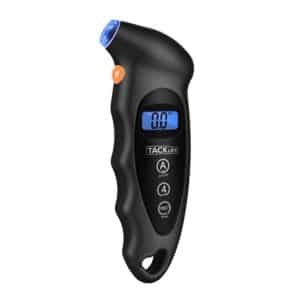 With this device, you can check your tire pressure with a max threshold of 60 psi reading so expect to get accurate pressure reading when you use it on your vehicle. This product is well-known and used internationally as well. A good thing about TireTrek is that this device does not need batteries. So how do you power it? You do that by plugging it in. It may be inconvenient that you have to plug it in every time when you use it but it will give you an accurate reading in just seconds so that should make up for the inconvenience. The material used in the making of this device is metal and brass. But don’t worry as it shall not rust or corrode. The display is a good one and this thing is backed up by a lifetime grantee so overall a great package. 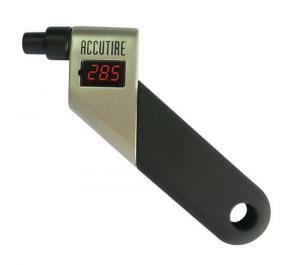 Accutire has a tire pressure gauge in store for us which is a very easy to use the unit and does it job quickly It has a very user-friendly interface which makes it easy to read the pressure off of It features rubbing coating for stability and good grip. Its well-lit display will not have you squinting to make out the reading in the darkness or bright light. Coming to its functionality, this unit can give manage a reading between 5 to 150 psi which is just too much for normal usage I mean, that way more than what normal usage requires so you are set for the future too with this unit. The head can be rotated for easy use. That’s not all. This unit features an automatic shut off feature in order to shut the air off when the designated pressure is achieved during the inflating process. To conclude, this unit is one solid device to have as it serves multiple purposes. Astro has a sleek looking pressure gauge unit that can read up to a max 50 psi pressure. It’s a unit under 10 dollars and it’s a simple gauge for what it can do. It’s one of best tire pressure gauges out there due to the fact that it’s cheaper than many alternatives and gets the job done just right. Because of its compact design, it can be stored easily and doesn’t need a lot of space. Or you can simply hang the unit in your garage or workshop so that you can take it off just as easily when you need to use it. Due to its ergonomic design and rubber coating, gripping over it becomes easier and the rubber grip doesn’t allow the unit to simply slip off of your hands during use. It is fitted with a bright LCD with a blue tint. Has an ergonomic design with rubber grips. It’s bright enough so that you can easily read it at night and day alike. It has the feature of auto shut off when selected psi is reached and batteries are included. When this device is left idle for 40 seconds, the LCD shuts off to save power which can be turned on again by a button there. This unit is backed by a 1-year warranty. 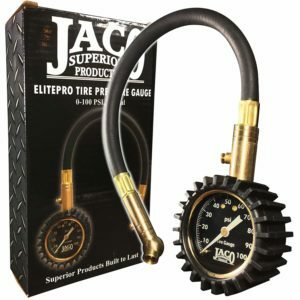 JACO is here with a nice tire pressure gauge for you. The company has worked hard on this unit to make sure it gets you accurate psi reading when you use it. For a proper measurement and psi reading of the tire, they have introduced their ElitePro gauge. This thing is certified by mechanics and included with the package is a hose to give space to use the device without having to sit close to the tire. It can read a max pressure of 100 psi which is enough for most common usage. A thing to note about JACO is that it offers a 100% money back guarantee if you are not satisfied after using their product so it’s a good assurance that your money is not going to waste if you invest in this unit. Overall, this unit is excellent in terms of price and quality. TackLife is somewhat like Tekton in this list. It features the right to light up to help you immediately spot the tire nozzle cap. 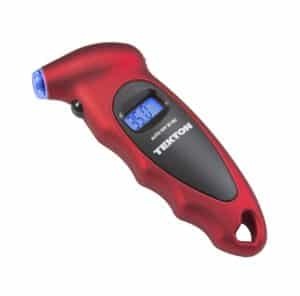 It features a button for a quick and easy turning of the device on and gets you the tire pressure reading in just 2 minutes. It also has the option of showing readings in different measuring units. It features an LCD display which has great visibility in the darkness and in bright light. The TG01 digital gauge is an overall low priced but accurate unit to use and with its ergonomic design, it will not slip off. To store it after use, simply hang it over in your garage or keep it in your toolbox. Most importantly, this unit is backed up by a 2-year warranty. 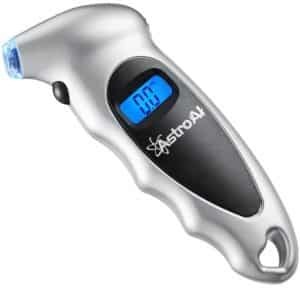 Astro’s digital pressure gauge provides an easy to use interface and lets you quickly get your tire’s pressure. With this product, a hose is provided so that you can sit at a distance as you take the tire pressure. Also, you don’t need to crouch over to use the device for long time periods because of the hose. You can simply stand upright and do the same without a problem as the hose is long enough to reach the tire even when you are standing. It’s fitted with a bright LCD display which quickly informs you of the tire pressure. Can be used to fill the airs with an air compressor attached. Its ergonomic design includes a rubber grip which helps you to hold the device tightly without dropping it. This will also ensure that the tool doesn’t slip off of your hands as you operate it. This unit would allow you to select your own measurement units such as KG, BAR or PSI. Other than just checking your tire’s pressure, this tool provides you with the functionality of inflating and deflating the tire as well which makes it a great multipurpose device. You need a pressurized air compressor to fill your tires with this! Last on the list is iTavah. It’s a digital pressure gauge similar to other products in the market. It consists of a bright LCD which shows you the readings accurately and clearly. This unit also comes with a bendy hose which serves the same purpose as others. To provide greater usability of the unit. One problem with this device is that it has old styled nozzles which are no longer used. The newer technology known as TPMS is used on cars which already have pressure valves, something not supported by this unit. In terms of usability, the gauge comes with a bendy hose and an adapter. This allows it to work with a maximum number of valve types. This LCD display on it is big enough to read and makes the process easier. It’s a low priced unit most can afford. You can use an air compressor to fill your tires with this also. The right tire pressure is essential because the right will allow the tires to turn smoothly. Incorrect tire pressure may put extra strain on the tires and wear them out quickly. It can also put a load on the suspension. As a result, you will face a poor fuel economy and bad vehicle performance. Often times, weather can have an effect on the pressure also. Sometimes due to heat, the tires can burst because air expands when heated. In such cases, having a tire pressure gauge can prove to be a wise investment. Why Maintaining the Right Tire Pressure is Necessary? Using the right tire pressure in your tires are very important for a lot of different causes. Here you will see the most common causes why you always should make sure you are driving with the correct tire pressure. Tire pressure is associated with your car’s brakes. Simply stepping on the brakes without proper pressure in tires will have to brake at a greater distance. That’s because the tires contact surface will get reduced if you don’t have the right tire pressure. Absolutely the most important part why you should check your tire pressure often. Think of your own and others security on the road! Fuel economy is the first thing that gets affected when you are driving with too low air pressure in your tires. It happens because, when the tires in a car have incorrect pressure, extra strain is put on the tires. The engine may need to work harder to move the wheels which need more fuel this, ruining the fuel economy. A car with too low air pressure will get a very bad handling when you are trying to steer the car, or may even cause serious accidents if you have to steer away quickly from an object on the road. Also, this shows the importance of the correct tire pressure. Driving around with too low or too high air pressure will cause load and unnecessary wear on your tires. Too low tire pressure can damage the inside of the tires fast and the only solution to this is replacing the tires. A lot more expensive than checking the tire pressure often. Too high pressure can also cause your tire to explode if you are unlucky. On hot days, when the tire gets hot your pressure will raise a lot and it can cause an explosion, and you really don’t want that when you are driving fast. How to know if there’s a leak in the tire? Let’s say, you checked the pressure of the tire on the first day of the week. You make sure all the tires are at the right pressure. You are good to go. You check again your tire’s pressure after let’s say, 3 days later or maybe a week, and you notice a significant drop in the pressure, then there’s a problem. Either your tire’s nozzle is leaking, or there may be a leak in the tire itself. Newer cars use TPMS systems and the cars digital function will tell you when it’s time to fill your tires. They will also tell you the tire pressure in your car, and in these cases, you do not have to use a tire pressure checker, but it can still help. In some cases, If you happen to be losing even 1 psi or greater after easy day in a consistent manner, then there has been a leak in the tire you weren’t aware of before and if you leave the tires without having them checked, they’ll soon get completely flat and get damaged if the car stands for too long. What types of tire pressure gauges are available? There are many different types of pressure gauges now other than the conventional, analog ones. There are 3 types of gauges, stick gauges, dial gauges, and the digital ones. So it depends on which you prefer the working of all of them are the same, but some are better than the other in some situations. These are old styled pressure gauges which can be commonly found in tire shops and gas stations. These have a clock like display which is knowns as the dial. These had been used for a long time and are still portable enough to be kept in the pocket. These gauges are equipped with an LCD which gives the numbers for the measurements. With these gauges, it gets easy to read for anyone. And it gives the readings in just a few seconds so it’s quick too. So in short, you get a quick reading of your tire from an LCD and now, these gauges also come with safety cut off feature which turns the air off when the designated PSI has been reached. Even though it’s a simple device, there are still some things you need to keep in mind before you go to buy one. These things ensure they are enough for your level of use and for your application, whether for car tires or other application. With that, you’ll not have your money go to waste. You do always want to make sure that the tire pressure gauge is within the range of the tire pressure in your car. You should check the max tire pressure on the gauge to make sure it’s enough. Most car tires use maximum 3 bar tire pressure and these can show a lot more, but it’s always worth checking if you are having a truck or anything else with higher pressure. While plenty of avid car lovers will usually pick out the old styled pen type gauge to get their job done, as they’re light-weight. With a lightweight unit with an ergonomic design and good grip, you won’t have a problem handling the situation. Most Digital units come as being heavier than the dial, style which are larger than the stick types. If you’ve got a small package for your vehicle without a lot of space in the car, that can be a problem. In the cases of digital tire pressure gauges, the display becomes an important aspect of the gauge. The display is how you are going to get your tire pressure reading from. If you have trouble reading the dial type gauges, then getting a digital one might be a good choice as it’s very easy to read the pressure. But if you are used to reading on dial gauges, then you don’t need to worry about getting the dial styled one. Some units need internal batteries to power the system and whilst many units require internal batteries to work with, they might all need different types of batteries. If the batteries get depleted, getting them replaced might be a big problem. A hose that is too quick is a bit restrictive whereas a totally long one might also make wearing the unit bulky. The best length is usually from 12-17 inches as this offers top reach and isn’t very cumbersome. Pressure Holding: The proper gauge may be capable of hold the pressure properly and for an excellent length. This permits you to study it properly and also minimizes probabilities or errors due to trying to read it fast before it loses pressure. Protective Bumper: You have to move for a pressure gauge that features a defensive bumper. Other than protecting the unit itself, it also minimizes the surprise and impact that may have an effect on the internal components. 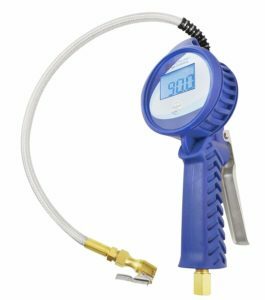 Air bleeding: A good and conventional tire pressure gauge allows you to bleed out air from the tire in the case of the tires being over-inflated otherwise you might need to cut the strain on your tires on various different road terrains. PSI Increments: A precise gauge could have moderate increments for stepped forward accuracy. A gauge with a 1 psi increment will deliver higher and greater specific consequences in comparison to that with a 5 psi increment. Other: Other crucial things consist of the layout (analog or digital), weight, size, portability, sturdiness, versatility, and price. Tire pressure does not take much knowledge to check. All you need is a pressure gauge. You just take the hose pipe, unscrew the cap from the tire nozzle, clip your hose pipe on the tire nozzle and you’ll know the pressure. But there’s one thing to checking the tire pressure. It’s better to check it when the tires are cool. It’s important to check the tire pressure when the tires are cold because hot tires will have a higher tire pressure. Let’s say you are checking the tire pressure and read 2 bar when the tires are hot, what happens when the tires get cold? Yes, the tire pressure will just be around 1.5-1.7 bar(Depending on the temperature). If you want to learn more about tire pressure you can check out our other article: What’s the right tire pressure? That is, before you use your vehicle to drive or after you park it leaving it for an hour to cool down. Commonly, every car loses 1 psi pressure every month, on light to moderate usage, so frequent checks are advised. Unscrew the cap on the tire nozzle, and attach the pressure pipe on it. If you hear a hissing sound, that means you are on the right track. It’s when a gap is created as you begin to clip the hose on the tire nozzle. As soon as you attach the hose, your LCD will blink and give you the reading in a few seconds. If the reading is near or exactly the amount stated in your car’s owner manual then you are good to go. More or less than that, and you’ll need to inflate or deflate the tire accordingly. Take off the nozzle cap from the tire and attach the hose from the gauge. Wait for a few seconds until the LCD screen on your gauge goes blank or starts blinking. You should then see the pressure of the tire. If the pressure is greater than it should be, let some air out and check the pressure again. If the air pressure is lower than it should be, then pump some air until the reading shows the right pressure. You can now remove the hose from the tire nozzle. Measuring the pressure of your tires doesn’t mean you journeying the tired middle or fuel station. You don’t want to rely on a gauge that supplies inaccurate measurements. You additionally shouldn’t worry approximately the reliability and durability of the gauge. To give you the list, it is vital to the recognition of the crucial functions which encompass accuracy, ease of use, sturdiness, versatility, sturdiness and easy reading. 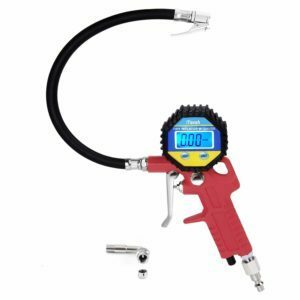 By picking an item from the anode evaluation, no longer simplest will you own a pinnacle tire pressure gauge but are assured of reliability, sturdiness, and maximum satisfaction. What is Seafoam and How do You use it?